The Sliverax is a sleek, extremely innovative folder designed by automotive engineer and knife enthusiast Paul Alexander. The first factory-made folding knife to combine an index-finger flipper opener with Spyderco’s patented Compression Lock mechanism, it offers lightning-quick deployment, impressive structural strength, and world-class cutting performance. Paul Alexander is a Doctor of Philosophy (PhD) in Mechanical Engineering and a researcher for one of the leading manufacturers in the automotive industry. With nearly 100 patents to his credit so far, he is a recognized expert in the design and engineering of automotive systems and a specialist in state-of-the-art industrial materials. And when someone of his caliber decides to try his hand at designing knives, it’s no surprise that the result is something special. 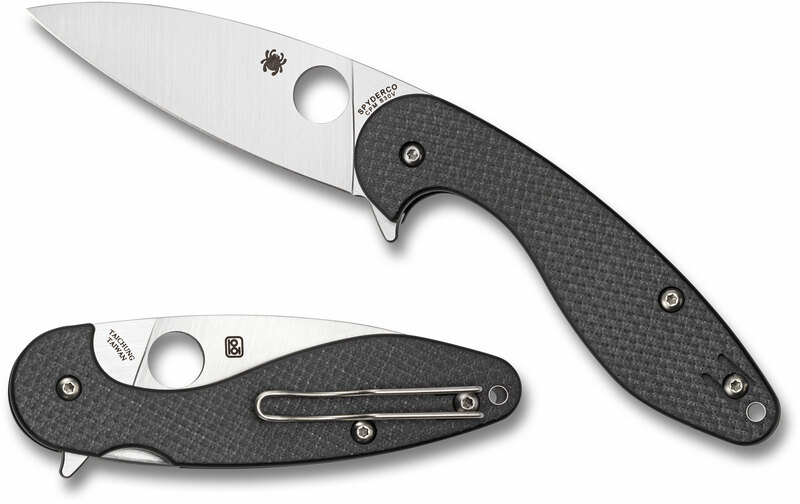 Alexander’s first collaboration with Spyderco, the Ouroboros, was released in 2016. It introduced the knife community to his highly refined design style and immediately whet its appetite for more. He quickly responded, pushing the envelope of creativity even further with the Sliverax. The Sliverax actually represents the confluence of three powerful features: a Kit Carson-inspired flipper opener, a fully accessible Trademark Round Hole, and Spyderco’s high-strength Compression Lock mechanism. The flipper and Round Hole allow the knife to be quickly deployed with a full range of one-handed opening techniques that both work equally well with either hand. The Compression Lock mechanism not only locks the blade securely open when in use, but also helps prevent unintentional closing of the knife because the lock release is located in the spine of the handle. This knife’s sleek drop-point blade is crafted from CPM-S30V stainless steel and features a full-flat grind for low-friction edge geometry. The seamless flow of the blade and handle creates a slightly negative blade angle, which enhances cutting leverage and places the point on the knife’s centerline for maximum utility and control. The negative angle also shortens the blade’s opening arc to further increase the speed and reliability of one-handed openings. Once open, the blade’s flipper serves as a highly functional lower guard to provide additional grip security when in use. The handle of the Sliverax features a lightweight, easy-to-clean, open-backed construction style that is both stylish and extremely ergonomic. Its stunning carbon fiber/G10 laminate scales are precision machined to house nested stainless steel liners that form the foundation of the knife’s high-strength Compression Lock mechanism. This patented lock is located in the spine of the handle and is mechanically very different than a conventional LinerLock. It offers far greater strength, greatly reduces the possibility of unintentional release during use, and allows the blade to be easily closed with only one hand without placing one’s fingers in the path of the edge. To provide the optimal balance between low-profile and immediate access, the Sliverax includes a reversible deep-pocket wire clip for tip-up carry. Its unique see-through style blends with the pants material and positions the knife low in the pocket for secure, extremely discreet carry, yet still keep it poised for a rapid draw. The Sliverax is a truly groundbreaking folding knife that showcases the talents of a world-class industrial designer and mechanical engineer. Combining the strength and user-friendliness of our Compression Lock with unparalleled ease of deployment, it offers unique advantages not found in any other Spyderco knife. The only reason it gets a 4 from me is my agreement with reviewer François, that this is not optimal - or even good, frankly - as a flipper, which requires a little bit of extra work (and voiding of the warranty) in order to get the most out of the knife.I bought a Sliverax used from a guy who didn't like the flipper tab hitting his finger when he closed the knife. He also did not like the lock closing left handed. My intention from the beginning was to delete the flipper, which I did, and as a strictly Spyderhole deploying knife, I find it to be a simply excellent blade. 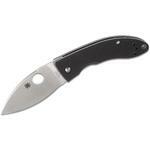 The knife looks and feels small, but with a 3.5" cutting edge, it performs like a larger knife. I can't think of another knife that packs so much cutting edge into such a small and carryable package. The ergos and aesthetics are beautiful, and it carries like nothing in the pocket.I have the clip set for left hand carry, and even with the flipper deleted, the compression lock closes just fine one handed when I use my index finger to "catch" the tang, stopping the close action, then re-position my hand and close it the rest of the way with the same index finger. It is kind of like one hand closing a lock-back, like the Endura. The size of this knife, being right between the size of the Endura and the Delica really hits a sweet spot of usability, ease of carrying, and "political correctness" around non-knife people. A big win, and my current favourite mid-sized EDC knife, far outpacing my previously preferred Endura in that role.The Sliverax's blade profile is great. Kind of like a long pseudo wharncliffe with a low enough point to be a great box cutting, and just enough belly to be a great slicer and utility knife. And the blade geometry is perfect on it. Very thin behind the edge, tapering to a fine point, and unlike the Manix 2 XL I own, and even the Endura, I felt no need to thin the main bevels out further, and it touches up very easily on the Spyderco grey and white Sharpmaker stones.This is my first wire clip knife, and I really like the wire clip. At first, I had difficulty withdrawing the knife from the pocket due to the slickness of the clip, but found that by putting the finger under the clip and pushing up on it, this was no longer an issue. Impressive attention to detail on this knife. Softer edges on the spider hole, great milling on the blade, smooth operation on the bearings make this one of my favorites.As some youtube reviews have pointed out, this knife is a brilliant flicker. The flipper tab works great to deploy but I find myself consistently favoring the middle finger flick over the index finger flip. There were some concerns on the Spyderco forums about the flipper tab coming in contact with fingers while using the compression lock. Compared to the PM2 it does require a little more care in closing to avoid the tab hitting fingers, but for me it's not an issue. I can close it with no problems and no contact, though I have thinner fingers than most. The carbon fiber and wire clip combo makes it very easy to slide in and out of a pocket as compared to the grippier G10 on the PM2 etc. which tends to snag. Of course for harder use or more active situations that extra pocket-grip is nice, but as a light duty EDC I prefer the easier access of the CF.If you like the design of the knife (which, in my opinion, is uniquely elegant) you certainly won't be disappointed. An excellent EDC and a great addition to any collection. 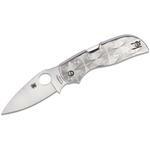 Spyderco has released another winner. The ergos on this are really nice, the feel of the G-10 with carbon fiber laminate looks really cool and offers a nice grip. This is my first flipper and I have started using a combination of the flipper and the spyder hole. Drawing this knife out of the pocket to open is lightning fast. So far I have had to cut zipties, fire hose, several boxes and other misc things.. I usually give my knifes a touch up on sharpmaker each day I use them so it remains razor sharp. Overall excellent knife. 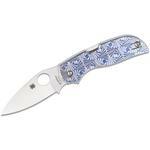 Hey, I wanted to share "Spyderco Paul Alexander Sliverax Flipper 3.48 inch S30V Satin Plain Blade, Carbon Fiber/G10 Laminate Handles" with you from KnifeCenter.